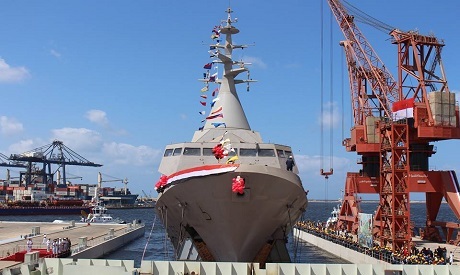 An impressive military celebration in Alexandria on 6 September accompanied the launch of ENS Port Said, the first Egyptian-built Gowind-class corvette. The ship was built in less than a year at the Alexandria Arsenal. The ENS Port Said is the first of three Gowinds to be constructed in Egypt in collaboration with the French national shipbuilder Naval Group. During the launch ceremony the Armed Forces’ Department for Morale screened a documentary on the challenges involved in the construction. With facilities updated to vie with the most modern companies in the field, the Alexandria Shipyard Company is now equipped to complete the construction of the three corvettes in accordance with the contract signed with France. The purpose of the project is to technologically update and strengthen Egypt’s maritime industries and bolster their ability to meet growing demands and challenges. Khalil said that before contemplating the building of such an advanced ship, infrastructural challenges had to be overcome. The Alexandria Shipyard, the fruit of Egyptian-Soviet cooperation, was decommissioned after the October 1973 War and fell into neglect. When the government put it up for sale the Egyptian Armed Forces offered to buy and refurbish it. The transfer of French technology to Egypt to allow for the construction of this state-of-the-art vessel posed a second major challenge. Khalil explains: “The French would probably have preferred Egypt to receive more ships than the number originally contracted for without having to transfer the construction knowhow. Captain Nabil Abdel-Wahab, one of Egypt’s valiant frogmen in the October 1973 War and a hero of the sinking of the Eilat after the 1967 War, says the launch of the first Egyptian-made Gowind-class corvette made him doubly happy. First, it showed how far the Egyptian navy has developed technologically and, second, because the ship was made by Egyptians. “To command the seas is to command one’s fate,” he said. It took 650,000 man hours of work to build the corvette, in addition to 110,000 hours to support the construction process. The project was divided into several stages, starting with technical preparation and passing through the planning and follow-through phases, all designed with an eye to optimising the benefits from this collaboration with the French-based Naval Group. A total of 2,100 Egyptian engineers and technicians were involved. During the launch ceremony, Commander of the Egyptian Navy Vice Admiral Ahmed Khaled explained that Egypt’s General Command was intent on carrying out a comprehensive strategy for the development and modernisation of the Egyptian fleet in order to enhance its capacity to face regional threats. The new ship is “the most advanced piece of hardware in the Egyptian navy,” he said, and “bolsters [the navy’s] ability to achieve maritime security, protect borders, safeguard economic interests in the Red Sea and Mediterranean, as well as ensure safe maritime navigation and guarantee the security of the Suez Canal”. “The difference between what we had in the past and what we have today is one way to express the added value of the Port Said,” said. “We are now one of the world’s blue-water navies. We operate on the high seas and do not have to return to port until our missions are complete. Today, in addition to our deployment off bases in Alexandria and Port Said, we are deployed in the Red Sea where we have established a Southern Fleet,” Khalil said proudly. Naval Group CEO Hervé Guillou said that the new Gowind is equipped with multi-purpose high capacity electronic sensors and combat systems, enabling the ship to carry out a range of surveillance, tracking and interception tasks with air, surface and underwater targets.